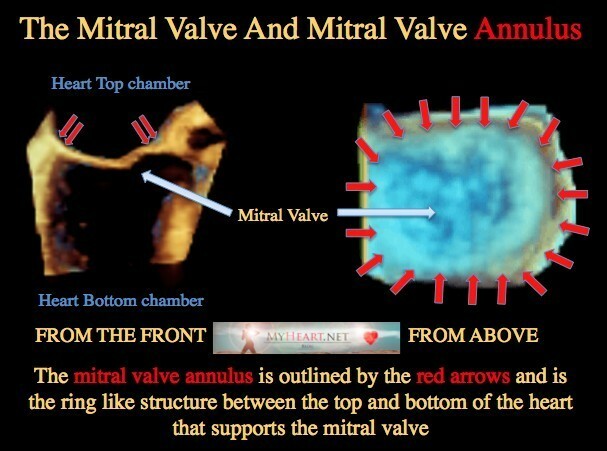 The mitral annulus is a ring like structure that separates the top and bottom chambers of the left side of the heart. The left side of the heart is the main pumping side. The upper chamber is the left atrium that collects blood returning from the lungs. The lower chamber of the left side of the heart is called the left ventricle, and is the main pumping chamber that pumps blood to the body. The mitral annulus sits in between the top and bottom chamber and houses the mitral valve. It can be thought of as a support ring for the mitral valve. The mitral valve is the valve that stops blood flowing backward from the left ventricle to the left atrium, and therefore allows blood to go forward in to the body where it is needed. What is Mitral Annular Calcification? Mitral annular calcification is a chronic process in which there is deposition of calcium in the mitral valve annulus. The mitral annulus is typically flexible. In mitral annular calcification it becomes less flexible and thicker. The posterior annulus is most commonly affected. In the majority of people the amount of calcification is mild and therefore usually of no significance. 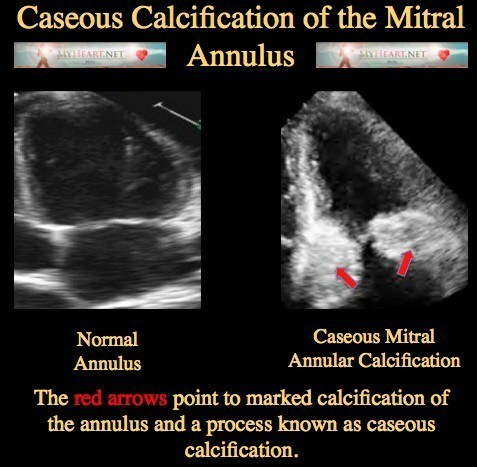 Calcification of the mitral annulus is increased in situations where there is increased stress on the annulus and valve. Mitral Annular Calcification may be associated with a murmur that is picked up on physical examination although often there will be no murmur. The diagnosis of mitral annular calcification is most commonly by echocardiography. 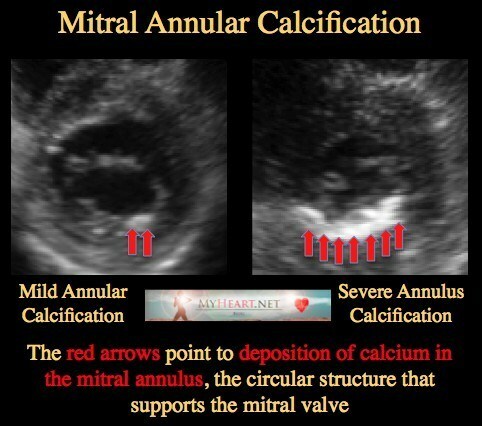 As in the pictures above, there is increased calcium deposition seen in the mitral annulus. Mitral annular calcification when severe can be seen on chest x-ray. It can also be picked up on CT scan and MRI scan. Mitral annular calcification is more common in women. 9% of woman and 3% of men over the age of 60 are found to have it on echocardiography. It is also more common in those with mitral valve prolapse. Mitral annular calcification is very common in those with chronic kidney disease, and is found in 40% of those undergoing echocardiography. Factors that increase stress on the mitral valve and its surrounding structures increase the chance of mitral valve calcification. The following conditions are associated with development of mitral annular calcification. Several studies have looked at the association of mitral annular calcification and the development of cardiac and other events. There is increased risk of heart attacks, stroke and death from cardiovascular causes. There is also an increased risk of development of atrial fibrillation with RVR, an irregular heart rhythm. The risk is probably explained by the fact that patients with mitral annular calcification have risk factors for cardiovascular disease. The presence of the calcium itself is unlikely dangerous. The presence of mitral annular calcium makes it harder for surgeons to repair the mitral valve, as surgery is technically more challenging. The calcium in the annulus can make the flexible valve more rigid and predispose to a leaky valve, however that is usually not significant. Mitral annular calcification is rarely associated with obstruction to blood flow and therefore typically will not have symptoms. Caseous calcification of the mitral annulus is a rare type of mitral annular calcification where there is extensive calcification and infiltration of the annulus accompanied by a liquid center, a process known as liquefactive necrosis. As can be seen in the picture, this has a remarkable appearance. It is usually benign, however it is important it is recognized, as it can be mistaken for tumor or other more dangerous complications that can lead to unnecessary interventions such as operations. Sometimes it resolves spontaneously. Mitral annular calcification is usually of no clinical significance and no specific treatment such as MitraClip is required. Those with mitral annular calcification are at increased risk of cardiac events, although this is still relatively small, likely due to the presence of traditional cardiac risk factors. Therefore it is reasonable to advise those with mitral annular calcification to pay attention to blood pressure, cholesterol, lifestyle, smoking, diabetes and other common risk factors. This will serve to reduce overall cardiac risk. I read the report of a cat scan and mentioned I had this. I am Diabetic under control. my last A1C was 6. I guess my one concern is As I sit quietly I can feel a click. It is not constant only as I am still and not really often. Have been on warfarin for several years due to a pulmonary embolus no reason found. I see my PCP every 4-6 mths. I know I will be discussing this with him son. For now I am waiting to see if there is Ca in my lungs. Recently diagnosed nodules found. for now any noncommittal advice would be appreciated. I wouldn’t worry about the mitral annular calcification for now. At some point an echocardiogram would be advised. Thank you for responding. The cancer was ruled out. Thank God! Do you recommend anything further for now? My brother in law passed away 5 months ago at the age of 31 from mitral valve prolapse with severe calcification of the annular ring. It was a shock to everyone because he always had a good BP and HR and never have chest pains. The only medical problem he had was severe stomach pains on and off for the past few years. The doctors could never figure it out and passed it off as pancreatitis. The last time he went to the ED, 2 years ago, a doctor said he had dangerously low vitamin D (although the drank milk all the time and was outside most of the day), but everything else seemed to be within normal limits. He did smoke cigarettes for about 12 years but had recently stopped. I was wondering if you had any insight on this? We were told his condition was hereditary and that’s why it was so advanced at such a young age. I forgot to mention it was sudden cardiac death. What was the stated cause of death, the valve disease in this setting is very unlikely to have contributed. The stated cause of death said “mitral valve prolapse with severe calcification of the annular ring”, which caused him to go into sudden cardiac arrest. All of his other organs looked good according to the doctor who did his autopsy and she said she couldn’t even tell he was a smoker because his lungs looked good. The valvular heart disease appears to be relatively mild in this case and if you have no symptoms then no specific therapy would be advised. I’ve had 2 stents, D.C.’s with A-fib, and now a CT this week shows calcification of the mitral annulus. I’m diabetic also with many health issues. My PCP has increased my beta blocker to help with the afib. How concerned should I be? With regard to the mitral annular calcification i would suggest obtaining an echocardiogram to evaluate the structure and function of the mitral valve. If it is an isolated finding that does not affect the function of the valve you don’t have much cause for concern. Hi. Is dense MAC with mild to moderate mitral regurgitation something to be worried about? The valve is of course not normal but the MAC and moderate MR in isolation can often be well tolerated and not a large cause for concern. Surveillance would typically be recommended. If symptoms were to develop then further testing may be required. I would have to see the images to comment accurately. If i were seeing a similar case, i would do a TEE as the next step with 3D to characterize the valve more accurately. I appreciate this article very much. I had a mitral valve repair (open heart) that couldn’t be completely done in August 2015 due to “giant bar of calcium posteriorly that precluded placing the valve sutures including the ring sutures.” I had MVP for decades, and severe regurgitation caused me to see the surgeon. After doing the partial repair, the post-op echo showed minor regurgitation. I had none of the palpitations that had plagued me for years for 14 glorious months but they started again. Heart rate goes to 160-170 for 90 minutes and finally settles down to 85 or so. Echo 17 months post-op shows SEVERE REGURGITATION again. Back to square one. Pre- and post-op diagnoses from operative report: “Mitral Annular Calcification, Severe Mitral Annular Calcification, Posterior Leaflet Prolapse; Paroxysmal Atrial Fibrillation.” Seeing surgeon in May for stress echo and consultation. He said maybe not surgery. I’m thin, eat super healthy, good BP, never smoked, no diabetes, 1 drink a month, a few cups of coffee a month. Why do I have these calcifications? Anything I should do? Are the palpitations related to the regurgitation? I get an “attack” about once a month. respected doctor, my 47 years old mother’s echocardiography result came and it said mitral valve is calcified, but other three valves are normal. she is obese too. should i consider valve replacement surgery? a suggestion will be appreciated. Respected doctor, my 47 years old mother is diagnosed with rheumatic heart disease with severe mitral stenosis and mild mitral recurgitation. The mitral valve is calcified. Also there is mild recurgitation in tricuspid valve. What would be the advised steps to treat this? She is obese and does have hyperthyroid. Also she has been asthamatic for about 16 years. A suggestion would be appreciated. Thank you. She has severe mitral stenosis and will likely require treatment. If the disease is symptomatic the question is, whether she is a candidate for balloon mitral valvuloplasty, or if the calcification means that she will require surgery instead. Respected doctor, How will i know if she needs valvuloplasty or valve replacement surgery? thanks for replying. I would start by clarifying things and seeing what the echo shows before you worry. If the TTE isnt enough an echo known as a TEE may be required. considered for my cause? I am on Oxygen 24/7 as I have no air capacity to do much, without stress! My B/P is fairly normal, I have a highstress # like 83, am 74 years old. Using feurosimide , but no heart medications as of yet! What do you think? There are many options available even for heavily calcified valves, however i would need to know a lot more about your situation and see the images to comment. is mitral and aortic annular calcification progressive? Are there risks involved during surgery with the presence of calcifications? Which surgery are you referring to? In general it is felt to be a chronic, somewhat progressive process. Thank you for the article, it explains the calcification very well. I’m told I have significant mitral regurgitation and I was hoping to have the valve repaired, but have now been told that due to calcification it will probably have to be replaced. I’ve no real symptoms of valve trouble, a little short of breath occasionally but nothing else, but they tell me it’s best to have the operation now while I’m still relatively young and my general health is good. In many instances calcification does not preclude valve repair, make sure you are seeing an expert reference mitral surgeon. Thank you for the article, helped me to understand my condition. I am 73 suffering from high blood pressure and mild type 2 diabetes. I was recently diagnoised to have very high calcification. I have sofar never been diagonised to have any cardiac disorder. I am now advised to go through Cardio Cath and Echo. I need to know, is there a high probability of me having a cardiac arrest at any time. Doctors told normal ..but asked to see the doctor if symptoms persists. How can we leave it and wait for symptoms. If the dr is not worried and there is no tightening or leak of the valve then there is likely no concern. up in the past. Can’t a lower level be used? In our center, if the patient is high risk for surgery we use different methods such as transcatheter methods that can successfully treat even calcified valves. I have been diagnosed with Bicuspid Aortic Valve and mild to moderate Aortic Insufficiency and mild Aortic Stenosis. Age 54. I have been monitoring progression with echocardiograms every si months. It has been stable. But in the last echo, there was a finding of moderate Mitral Valve regurgitation and Mitral Annular calcification. Previously, the Mitral Valve was normal. I don’t know if Mitral Calcification it is related to kidney. My kidney had been normal last year but latest blood report kidney function r has dropped below normal. EGFR=49. Normal=60. Creatinine=1.76. Normal=1.33. Symptoms: My cardiologist said my November 2017 Treadmill was okay. I had reached the target Heart Rate. I am normal weight but have been feeling tired on exertion but Dr says that is likely caused by aging and fitness rather than valve issues. 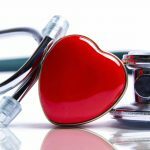 Will exxercising and improving my cardiovasculaar fitness improve the symptoms of Aortic and Mitral regurgitation? When you say you get tired do you get overwhelming tired where if you had the opportunity you would fall asleep ? whereas usually you felt just minor fatigue? Chances are if your lower body (upper thighs and lower legs) feel heavy your heart is working overtime and you should be considered for mitral valve replacement/repair. You know your body best. Don’t just go with what the doctor feels. Get a second opinion. My opinion…good luck with that. Dr. I have had numerous chronic health issues, worsening since age 17yrs. I now an a just turned 50 yr old woman who 13months ago had a major open heart,(using the heart lung bypass due to inability to do the Davinci robotic, full sternectomy) to repair mitral valve, Goretex neo-cords x 2 sets to P2,#33 (Medtronic) Duran AnCore annuloplasty Band implanted, left atrial appendage exclusion with #40 Atricure clip. I did have complications that kept me in hospital for close to 3wks.I came from N.C to the Cleveland hospital, where I knew they had a great reputation for what needed to be done. But now with my EDS,& other disorders causing more issues, for I do have dysautanomia (umbrella term for the many other issues, most rare, so far at least 14 documented diagnoses,) my issue is now: my Heart rate is higher than ever, staying even at rest between 110-150. BP averages 130/100- 180/110 when in past it would from my POTS go back and forth between very high to very low. Worsening Pulmonary Hypertension and pulmonary fibrosis, I could go on, but my new concern is , why do I now have calcification on the repaired MV.? this discovered after a contrast CT for abdomen, which was done as emergency 2 wks ago,from chronic GI issues, that have begun again. Do I need to worry about the Valves & go back for a follow up to Cleveland or is this par for the course and I need to just live to my best ability til ???. For I do know that time isn’t my best friend. But if there is something that can prolong and help I want to,just dont want to keep chasing for hope that only is a short time til the inevitable. And yes, I was a healthy, thin build woman, because of my health,I have always took extra care, eating healthy, exercising ( til now cannot) so I am doing my part. But with pain, and deterioration, I am at my wits end, any advise on how normal it is / or do I need to do anything to help myself in regards to the valves ,before I go across country again, would be most helpful and appropriated. Thank you. Its unlikely the annular calcification is new, rather it was likely there prior to the operations. The symptoms are likely unrelated to the annular calcium.